Picture it. You’re standing on a paddleboard in the middle of Lake Ontario, 25km from the nearest slice of land, and the only sight beyond rolling 3 foot swells is the faint outline of the Toronto skyline. There is no cell phone coverage, no boats and no sound beyond the rolling waves underfoot. This is the middle-of-the-lake feeling that you experience when crossing Lake Ontario on a paddleboard. 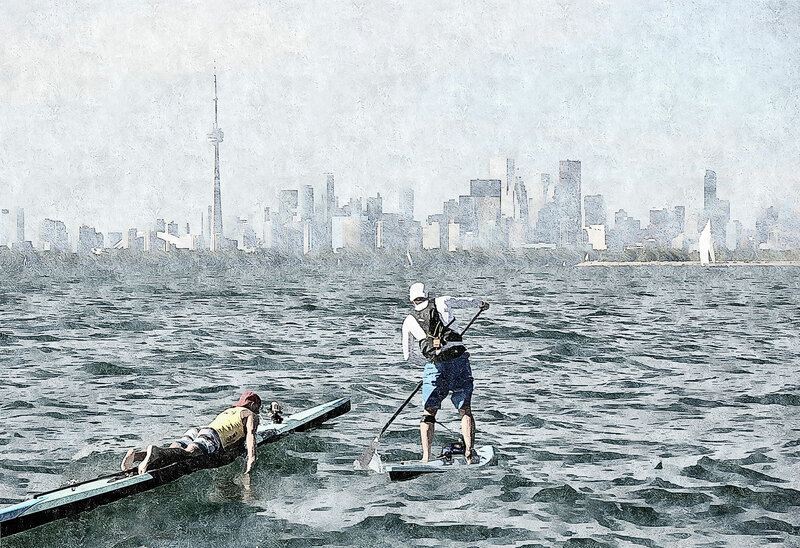 In September 2014, Dan Michaluk and I completed the first (traditional prone paddleboard) and fastest (standup paddleboard) crossings of Lake Ontario. A year later, Gander Tawaststjerna joined us on our second crossing in what proved to be challenging ocean-like conditions. For 2016, the sheer awesomeness of these past crossings prompted us to create Canada’s first and only open-water distance race for standup and prone paddleboarders. The traditional route from Niagara-on-the-Lake to Toronto roughly follows the historic swim crossing route set by Marilyn Bell in 1954. And, the 32-mile, point-to-point course happens to precisely match the gold standard of long-distance paddleboard racing established by the Molokai-to-Oahu crossing in Hawaii and the Catalina Classic in California—right here on our Lake Ontario waters. Make no mistake. Although this is a fresh-water endeavor, a Lake Ontario crossing is a big and exposed paddle that rivals its Pacific Ocean counterparts. At the midpoint of the crossing, paddlers are effectively ghosts without cell phone coverage for at least three hours. Weather on the Great Lakes is highly variable, often changing from calm winds to gale-force conditions in minutes, and six-foot swells are common in the autumn months. Most importantly, the paddling community on the Great Lakes continues to grow at a rapid clip, and paddlers are constantly looking for new ways to push their limits—an open-water crossing race on par with the world’s best will surely provide an avenue for that. At the same time, we’re continually amazed at just how underutilized certain parts of Lake Ontario are from a recreational perspective. Countless hours are spent training and surfing (yes, surfing) out there in absolutely beautiful conditions…all alone. Waterkeeper plays an important role in keeping our lake clean; we hope that a major event like the Lake Ontario Crossing Paddleboard Race can get more people into the water.